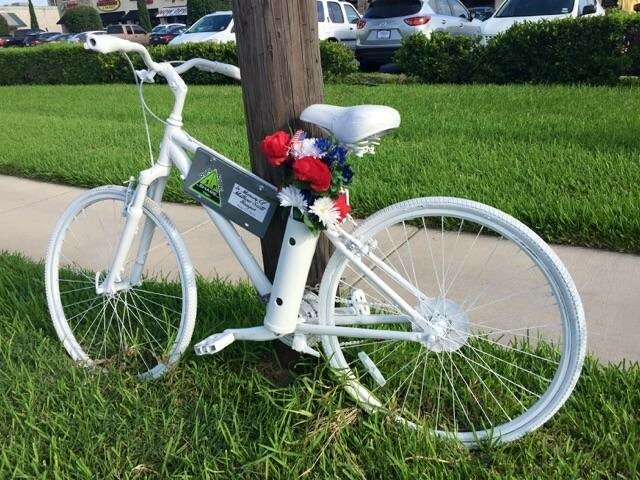 That white bike you see by the road fastened to a light pole or sign signifies that the life of a cyclist was taken during a bike ride. Many times, if you get the chance to speak to a cyclist, you’ll begin to understand that the bond between the cyclist and their steed is unlike any other relationship between a human and an inanimate object. It is almost like the two become one. Neither can do what they were designed to do without the other. The white bike is a ghost bike waiting patiently for it’s owner to return to it so that they can finish the ride they started. Weird thing about ghost bikes is that way back before I was even running, I worked at a television station and one of my projects was an awareness campaign with a 15 year old boy, Jake Ramon, who produced an award winning documentary about bicycle safety in the Rio Grande Valley after the tragic loss of Roy Carlson on Trenton road in McAllen. Jake’s mother is a cyclist with Team McAllen. Jake’s father is the big brother of one of my best friends when we were in elementary school. God seemed to have planted the seeds earlier and I just never quite saw the signs to what I was about to embark on. Prior to becoming a cyclist, I drove my car with my phone texting all the time. I saw the white bikes by the road but never really paid much mind to them. And that’s why I’m so vocal. I want all of us to know better so we can be better. And I know I’m not alone in this. I’ll see you at the Ride of Silence tomorrow. This entry was posted on May 19, 2015 at 3:28 pm and is filed under cycling, Running, triathlon with tags 5am wake up ride, bicycle, bicycle safety, bike, bike safety, city of mcallen, cycling, cyclist, death, fatality, ghost bike, hit and run, mcallen, ride, ride of silence, run ride share, Team in Training, team mcallen, texas, tx. You can follow any responses to this entry through the RSS 2.0 feed. You can leave a response, or trackback from your own site.